For David Oklahoma, painting is all about the process. He does not begin with a concept of the end result. He layers color over color, scrapes and scratches to excavate earlier hues, and shapes textural elements. The paintings are crafted organically in an active, often visceral, process. His media and tools (inks and brayers) borrow heavily from a past exploration of printmaking. 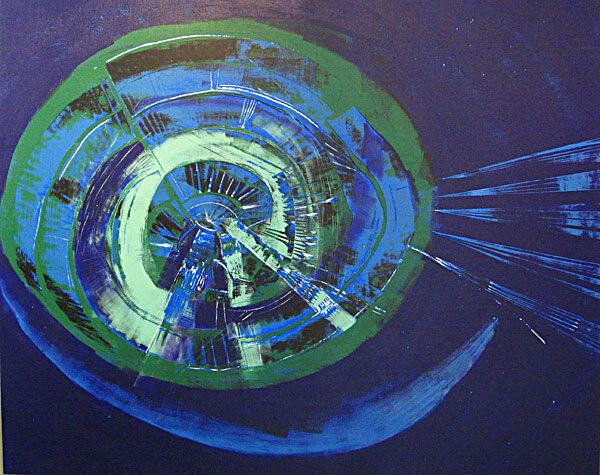 But the resulting works are unique, large-scale paintings. Each one individual. Each one a world – of color, shape, and texture – unto itself. David is a now a working artist based in Santa Fe, but he lived and worked in Tempe, Arizona for 14 years prior to moving to New Mexico.